The most energy-efficient version of the classic Vignette design – these shades trap air, creating an extra layer of insulation to keep your home cooler in the summer and warmer in the winter. 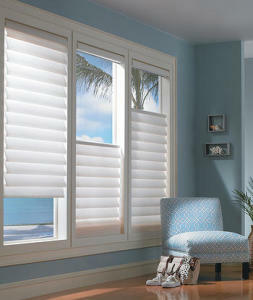 Modern Tiered Vignette option allows shades to stack up, down or anywhere in between. Traversed with Vertiglide™ offers an exceptional solution for large expanses of windows and sliding glass doors.